Broomsticks, pointy hats, black cats and big noses: there’s no costume more timeless and classic than a witch. But even more important than her famous accessories, the modern-day witch completes her spooky ensemble with some fierce makeup. Whether you want to go green and ghoulish, subtle and ***y, or something in between, there’s a wicked witch look out there that will have you practically cackling with glee. Tie back your hair. You want a green face, not green hair! 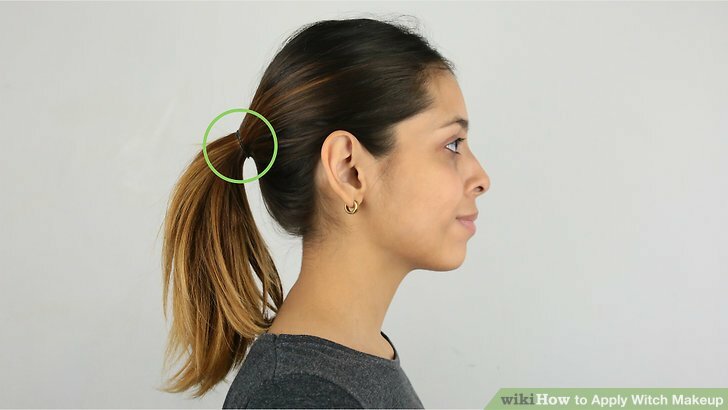 Pull it back in a ponytail and tuck it behind your ears. For even more security, slip a wig cap over your head. Set a base layer of face primer and foundation for a less spooky look. For a ***ier, less-green witch, grab primer and foundation in your natural skin color, or go a couple shades lighter to maintain a ghoulish feel. Rub on your primer, then dab foundation on your face and blend it out with a brush, extending down and blending with the skin on your upper neck. Using your fingers, rub concealer under your eyes or on any spots, then brush on some powder to help the makeup set. Contour your face subtly for a hollowed look. Brush a brown or tan color along the tops of your cheek bones and the edges of your jaw with a makeup brush and blend it carefully. Use a thinner brush along the ridges of your noise. Highlight the tops of your cheekbones and the tip of your nose with a light brown or white eyeshadow to get a 3-D effect. Your eyes will be pretty dramatic, so you can either keep the contouring subtle or use it to enhance the witchy look even more. 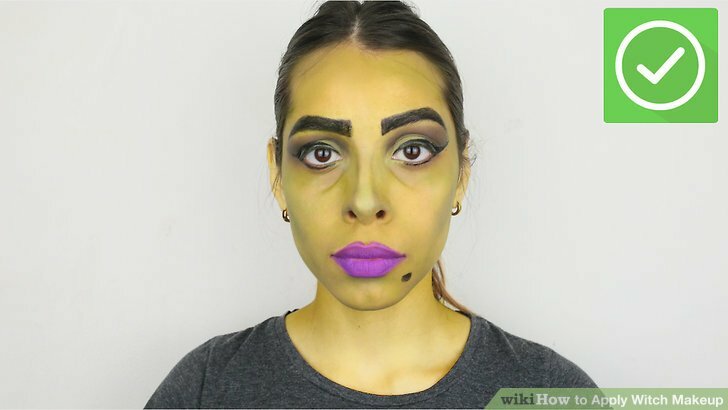 Paint your face and neck with green face paint for a spooky look. Buy face paint at your local costume store or makeup boutique. Mix a darker shade with some white for a less intense color, or ramp up the impact with a neon or lime green. If you have very sensitive skin, consider applying a thin base layer of natural makeup under your green face paint so your skin doesn’t become irritated. Squeeze some paint onto a palette or paper plate and use a soft makeup sponge to dab it onto your face, blending as you go. Apply it as close as you can to your hairline, onto your ears if they’ll be exposed, and down your neck and chest to meet the neckline of your dress or shirt. Leave your eyelids bare, since you’ll be doing a smoky eye look later. Dab away the excess paint afterwards with a fresh sponge. Blend green eyeshadow over the paint to prevent creasing. Use a medium-sized makeup brush and choose a green that’s similar to your face paint. This extra layer will help the face paint set, so you won’t have to worry about it creasing or smudging. Use a yellow eyeshadow as highlighter over the paint. With a clean makeup brush, apply a yellow eyeshadow under the inner corners of your eyes, blending it towards your nose, and along the tops of your cheekbones. 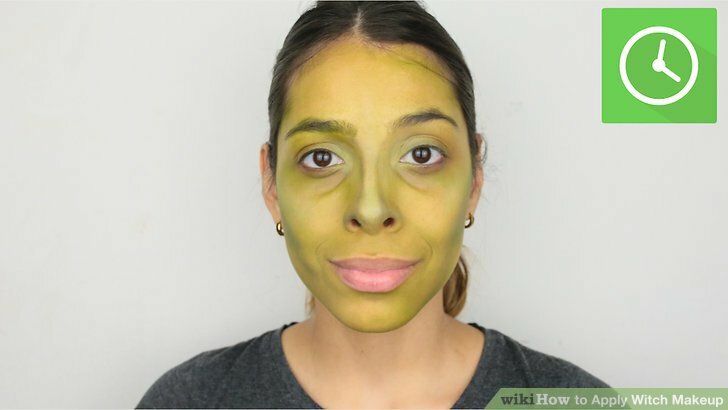 Contour with a dark green eyeshadow to complete a green face. Use a fresh brush to apply forest green eyeshadow along your cheekbones. Use a thin brush to paint dark green liquid liner onto the ridges of your nose, going from the top to the tip. Blend it with a makeup sponge to get a witchy, long-nosed look. You can also dab a bit of the same liquid liner onto your chin with a makeup sponge to achieve a pointed effect. Can’t figure out where to contour your cheeks? Pull a “fish face” to make your cheekbones pop and apply your eyeshadow. Let any face paint dry before you get dressed. To make for an authentic green witch costume, try to cover up exposed skin that you don’t want to paint green, like your hands and ankles. Use long black gloves and a long skirt for a look that’s both elegant and efficient. Buy a large witch hat or move your hair forward if you’d rather not paint your ears. Brush on a green cream eyeshadow to blend with green face paint. Apply it with a small brush, spreading the eyeshadow gently across your upper and lower eyelids and blending it with the face paint where they meet. Use a shade that approximately matches the paint. Add a dramatic cat-eye to your green-faced witch. The farther you extend the cat-eye, the more striking the style will be. If you want to be a spooky witch with big, haunting eyes, go for it! Brush some matte black eyeshadow onto the top of your eyelid and follow the crease line out. Then, use a green eyeshadow to blend it out into your green face paint, towards your nose and underneath the the lash line. Choose a bright green shadow for the main part of the lids and apply with a small brush. Use a black liquid liner to create a thick line just below your lower lashes and above your upper ones. Extend it out into the cat-eye tail and blend it out. Create smoky witch eyes for a subtler, ***y look. To achieve the neatest cat-eye, place a piece of tape just under your eye so that the straight edge curves out a bit towards your temples. This will ensure that you get a neat, elegant extension as you apply your eyeshadow. If you use tape, make sure to do your eyes before you prime and contour the rest of your face. Use your fingers to spread primer on your eyelids up to your eyebrows. Then, rub on a brightly-colored eyeshadow with your fingers, using multiple layers to make the color pop. Try green or purple for a classic witchy look, or experiment with other neon colors. Blend a matte brown eyeshadow into the crease of your eye with a large blending brush, just above the colored eyeshadow. With a smaller, tapered brush, blend a black eyeshadow into the outer corner of your eye and into the crease. To make your colored eyeshadow pop, use a small brush to swipe on white eyeshadow below your brow and along the inner corner of your eye. Apply a black liquid liner along your upper lid, following the crease outwards towards your temple. Use false lashes and mascara to make your eyes pop. Both spooky and ***y witches need big, striking eyes, so invest in a pair of dramatic false lashes or layer on that mascara. For an extra shimmer, dab on a bit of silver glitter eyeshadow. Use prosthetics for a creepy, spooky look. 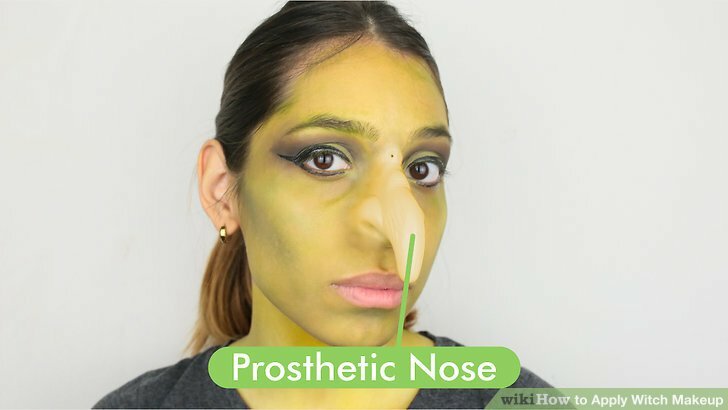 Buy a fake hooked nose, a pointy chin or a stick-on wart at a costume supply store. Apply them using the directions on the package and make sure they’re safe to use with makeup. You can stick on your prosthetics before your do your makeup, or add them on after and swipe on a bit of extra green paint. Accentuate your eyebrows. Use a thin brush and black eyeliner to fill in and darken your eyebrows. Paint it past the end of your brows for an elongated look, or arch it upwards for extra drama and a pointier, more evil feel. For a non-green witch, you can also use brown eyeliner to define your brows. Paint your lips with green, black or purple lipstick. If you’re using a lip brush, begin by outlining your lips, emphasizing the cupid’s bow and making it pointier if you want an extra evil look, then filling in the main part of the lips. You can also apply straight from the bullet, keeping your hand steady and applying slowly. Choose a black or purple lipstick for an intense, dramatic effect, or go with a slighter darker shade of green than your main face paint color. You’ll look spooky and witchy either way. Add a fake mole as a playful touch for a ***y or spooky witch. Using an eyeliner pencil, dot a small point below your lips, to the right or left of your chin. Twist the pencil to get a nice circle effect. Face paint can be difficult to clean out of a makeup sponge. If you can, use an old one that you can throw away afterwards.